* Light refreshments will be served on a first come, first served basis. Your RSVP by March 9th will be greatly appreciated. 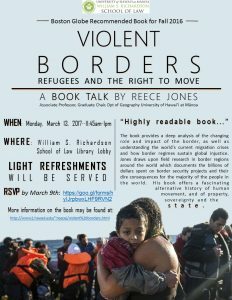 The focus of this book is on how borders are formed and policed to understand the world’s current migration crises and a deep analysis of the changing role and impact of the border, as well as how border regimes sustain global injustice. Forty thousand people died trying to cross international borders in the past decade. According to the author these deaths are not exceptional, but rather the result of state attempts to contain populations and control access to resources and opportunities. While globalization is prevailing, limiting the free movement of people is reality. With the growth of borders and resource enclosures, the deaths of migrants in search of a better life are intimately connected to climate change, environmental degradation, and the growth of global wealth inequality.